There are many benefits to using buyer personas, but before you can realize those benefits, you must create the persona. To help you get started, we are sharing our tried and tested B2B persona template. 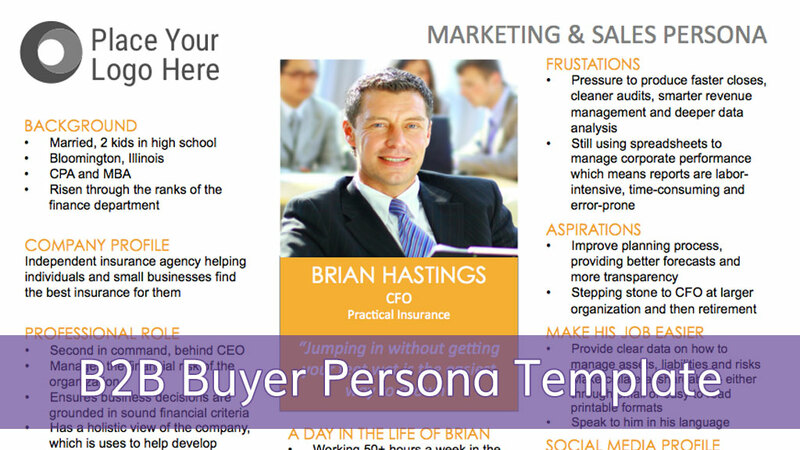 Simply download the B2B Buyer Persona, and replace the information for Brian, the CFO at an insurance company. The step-by-step guide outlined below will help you document an effective buyer persona. Keep it fictional, but be realistic. While these are fictional characters, they are based in fact and should be based on qualitative and quantitative research. You don’t have to (and won’t) have answers for every question, and that’s okay. Complete what you can using your qualitative and quantitative research, and then use your best-guess to fill in the holes. Through experimentation and feedback from your sales team, you will learn if these assumptions are correct. The first draft is not the final draft. This is a living document that you will continuously update over time as you learn more about your B2B buyer persona. Put yourself in their shoes. Remember, you want to define the persona from their perspective – not yours. The background, or demographics, is the basic information about your ideal customer. This can include age, gender, education, income, marital status, geographic location, length of time at job or any other demographic or biographic information that will allow you to better visualize who are targeting. Thanks to your marketing database, you already have a lot of this information. Combined with some basic demographic research, you can complete a fairly accurate background for your target persona. Pro Tip: Be specific enough that you can visualize the persona, but not so detailed that you limit who this persona applies to. Adding a name helps to humanize the persona, painting a picture of a real individual. In addition, there is the added benefit of creating a shared language that becomes organizational shorthand for this very specific target. Selecting a name that everyone can agree on is a lot harder than it sounds and it helps to come prepared with a list of names. For era-specific names, check out the Social Security Administration’s list of baby names or and online name generator. Pro Tip: To keep the focus on your persona, avoid using a name of someone you know – this includes current customers, co-workers or family members. A photo puts a face to the name, and makes it easier to visualize the persona when you are writing content or discussing strategy. Images can be found on Flickr by searching for “portrait” under creative common license, or through a stock photography website. Pro Tip: Once your persona has been created, go back and consider if the subject in the photo you have selected embodies the descriptive information in your persona document. If not, don’t be afraid to make a change. Some marketers like to include a company profile to complete the visualization of the persona they are creating. This often includes a fictional company name and/or brief description. To uncover this information, review the list of industries you are targeting. Take a look at your current customers and see if their are any commonalities in terms of company size, revenue, geographical locations, etc. Pro Tip: Be sure your company profile does not match too closely with any existing customer or client. If it does, you’ll bring along a history and a set of feelings toward that client that might not be as broadly applicable. Identifying and outlining the role gives you a better understanding of what this person does, and the scope of their responsibilities. While job titles may vary from company to company, a well defined professional role can help make sense of job titles, which may vary between companies or industries. Again, turn to your marketing database or CRM to find a list of job titles. Job sites, like Monster.com or Indeed.com, can be a great resource for completing this section. Pro Tip: As titles may vary from company to company, you may want to keep track of other job titles associated with this role. A day in the life is meant to be a snapshot of how your persona spends their day, starting at the beginning. By identifying the things that are dealing with on a daily basis, you get a better idea of how the professional forces in their life may be impacting how they consume your marketing and sales messaging. The sales team will have valuable insights into these activities, as do industry-specific articles and blogs highlighting “A Day In the Life Of”. Pro Tip: Make sure that the information contained in this section is unique, and does not overlap with what you have listed under “Professional Role”. Often referred to as their pain point or challenges, this section highlights the personas major sources of frustration and daily struggle. By identifying what these are and how they make the persona feel, we gain valuable insights into the internal needs of the prospect. These insights alone allow us to craft messages that offer a solution, and may even evoke an emotional connection. Industry surveys are a great resource for finding external frustrations, while the sales team and industry forums/chat rooms offer valuable insights into internal frustrations. Pro Tip: To ensure an accurate (and actionable) persona, make sure you identify their top frustrations – not just the ones that apply to your product or service. Aspirations are the things that the persona wants or needs, both professionally and personally. Understanding wants and needs allows us to create more targeted content, and may even lead to the development of additional products or services as we identify gaps in our current offering. Similar to frustrations, industry surveys, forums, chat rooms and the sales team are great resources for uncovering what it is that our persona wants. Pro Tip: Does your persona have too many aspirations (or not enough)? A little bit of rephrasing can turn a frustration into an aspiration, and an aspiration into a frustration. Brand affinities are the reasons that the prospect is drawn to your product or service. Acting as an overall guide for your interactions, key brand affinities are the foundation for your marketing strategy and provide the tonality of your messaging. The best way to find out what your persona values is to ask them through customer surveys, focus groups, or by combing through past customer reviews. Pro Tip: Every brand has a personality. Defining these brand personality traits, and identifying which appeals to your persona, gives you the ability to apply them when designing both collateral and customer experiences. Identifying the social media channels that your persona engages with, and what they do when they are on those channels, are useful when evaluating channels. Social media analytics provide great insights into your current users, while industry reports on engagement and overall social media use may help to identify opportunities to increase share of voice with specific demographics through targeted messaging and content. Pro Tip: Try and avoid generalizations – just because the majority of your target audience isn’t on Twitter, it doesn’t mean the audience isn’t there at all. This section outlines where the persona gets their information. This may include industry publications, trade associations, networking events, or conferences and trade shows. The key is to identify, as specifically as possible, where this persona is going when they have a question. Customer surveys, focus groups and your sales team can all offer insights as to how the persona is accessing information, and what may be influencing their decision-making process. Pro Tip: Don’t force it! Not every persona will read an industry publication, be a member of an association or attend a networking event. Instead, focus on the information sources that feel right for your persona based on demographic information, role and industry. The purpose of this section is to identify things that you can do, or tools/information you can provide them, that will make their job easier. The Frustrations and Aspirations sections are great for identifying opportunities to make the personas life easier, as is direct feedback from your customers and sales team. Pro Tip: Be careful that not everything outlined in this section is product-specific. Opportunities to make their job easier can also include how/when you are communicating with them and the type of information you are providing. A short quote can exemplify what your persona is all about, and encapsulate the persona’s attitude – either in general, or towards your product or service. Inspirations for persona quotes can come from customer surveys, focus groups or the sales team. Pro Tip: Think of the quote as a “check for understanding” – once every other section has been developed, compare your quote to see if it aligns with what you have documented. If it does, you are on the right track. If not, identify what feels “off” and work towards adjusting it. To get started drafting your own persona, download the B2B Buyer Persona. This is a helpful and interesting post, Elizabeth. You have provided plenty of useful information. I have just a few observations to add. First, I don’t see much difference between your template for a B2B and a B2C persona. I think the two must be quite different. The goals and behavior of the B2B persona are likely to be heavily influenced by the persona’s seniority, title, or level of responsibility. They are also likely to be influenced by the business function in which s/he works. People in Finance, for example, think and act very differently than people in Sales. Senior leaders will think very differently than middle managers or lower-level employees. So I think the B2B template must accommodate the persona’s level of seniority and business function. Second, it would be good to add a section that addresses the persona’s beliefs and world view. For example, if the Chief Information Officer is likely to believe the Cloud presents big security risks, then this belief should be mentioned in the CIO’s persona. For a very good discussion of how to prepare B2B buyer personas, I highly recommend Adele Ravella’s book “Buyer Personas: How to Gain Insight Into Your Customers’ Expectations, Align Your Marketing Strategy, and Win More Business.” Ms. Ravella urges her readers to interview people, not just perform surveys or online research. Ms. Zhivago rightly points out that use of buyer personas can be confusing. They can mire you in too much speculative and irrelevant detail. Often, it’s more valuable to understand your customers’ various path’s to purchase. It’s usually not necessary or even helpful link these paths to purchase to one or another buyer persona. What matters is that your website, your sales strategy, and your content strategy make it easy for your customers to find all the information they seek through their preferred paths. For example, if they normally use social media to identify potential vendors, you’d better be in social media. If they use Google search (and most customers do), then you’d better have high organic search rankings for the keywords they use to find a solution like yours. If they consult industry analysts to prepare a short list of potential vendors, you’d better be sure the leading industry analysts are familiar with your offerings and think highly of them. Ms. Zhivago, like Ms. Ravella, is a big proponent of interviewing customers directly to learn about how they think and act. Both authors provide excellent, detailed how-to advice in their books. Thank you for taking the time to provide such thorough feedback. The suggestions on “Buyer Personas: How to Gain Insight Into Your Customers’ Expectations, Align Your Marketing Strategy, and Win More Business” and “Roadmap to Revenue: How to Sell the Way Your Customers Want to Buy” both sound like interesting reads, and I will need to check them out. In regards to the templates, while the layouts are the same, they do contain different information. However, I think you draw attention to a very important point in that the persona is only as good as the information it contains. Understanding their role within the organization and documenting their biases and what influences them provides the insights needed to map the customer journey, which is sounds like you are describing. We love customer journey mapping. It supports the Iterative Marketing methodology. So much so, that it is one of the six key components.